Fast, easy, and economical, the recipes in Microwave Cooking for One are ideal for individuals, whether they live alone or share busy modern households. From breakfast through dinner, fresh, delicious meals can be prepared to satisfy personal tastes without wasted food, overheated kitchens, or messy clean-up. Spiral Bound. Picture on an imposing castle on the moor—the cavernous main hall, the fire roaring in the hearth, a bearded man reciting Burns, and the merry men home from the hunt enjoying a festive banquet. Paperback. A book of budget recipes, with no unusual ingredients, More Looking at Cooking presents many savory, easily prepared, and tried-and-true dishes that have withstood the test of time. For genuine Texas barbecue, there is no better person to ask than Mr. Dickey of Dickey’s Barbecue. With more than two hundred locations countrywide and generations of experience with a grill, this renowned restaurateur has now made his family secrets known. More than one hundred recipes and pointers, from ribs to cocktails, make this cookbook an essential. Mrs. Simms’ Fun Cooking Guide is written for the economical cook and the relaxed hostess. Many of these tempting recipes can be prepared ahead of time and chilled until time to pop them in the oven or carry them to the dining table. 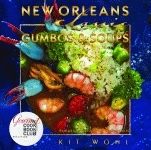 Whether you are cooking for two or a crowd, Myrtle Landry Simms makes cooking New Orleans Creole and Louisiana Cajun country dishes—as well as traditional menus—easy, fun, and best of all, delicious! Hardcover. In 2003, the Mustard Seed Café and Cooking School became Ohio’s first certified organic retailer. Founded in 1981, this shopping and dining establishment celebrates good food, fresh ingredients, and sustainable living. This encouraging and easy-to-follow book includes 250 natural brunch, soup, salad, fish, meat, vegetable, bean, grain, pasta, drink, and sweets recipes. The cuisine of New Orleans, like jazz, is a native art form. The artists who make it work are the chefs the city where food is more than mere sustenance. It is a social event—a celebration of color and smell and things that taste good. 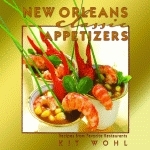 This gift cookbook is a compilation of favorite hors d’oeuvres from renowned New Orleans restaurants and chefs. Beautiful photographs accompanied by musings run concurrent with recipes from some of New Orleans’ finest restaurants and most-skilled chefs. Classic recipes such as Antoine’s Crabmeat Imperial, Cochon’s Watermelon Rind Pickles, and Restaurant Cuvée’s Shrimp Remoulade Napoleon accompany some new favorites such as Dickie Brennan’s Bourbon House Oyster Shooters and Restaurant August’s Honey Island Chanterelle Tart. 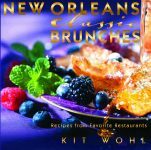 It makes perfect sense that the Big Easy, with its knack for nostalgia as well as its passion for living in the moment and savoring it, would be the home of so many decadent recipes for that most luxurious of meals—brunch. In this gorgeously photographed book, Kit Wohl has compiled fifty recipes from the city’s legendary restaurants and chefs, complete with straightforward instructions for attaining easy elegance any time of the day. Who wants to wait for Jazz Fest to snack on crawfish bread? Got a yen for Sucré’s Mardi Gras King Cake? 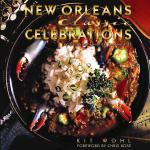 These fifty recipes from the city’s famous chefs are an all-access, anytime, anywhere ticket to New Orleans celebrations and festivals. New Orleans lays claim to so many things—jazz, Mardi Gras, festivals, and food—so it makes perfect sense that the Big Easy would be the home of the first cocktail. After all, libations are a New Orleans custom. 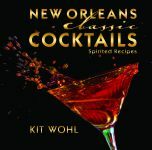 In this brilliantly photographed book, Kit Wohl has compiled more than sixty luscious beverage recipes, both traditional and eccentric, from the city’s legendary and quirky establishments. Creole food is the freewheeling legacy of a celebrated, storied city. The culinary practices of Spanish, French, Italian, German, African, and Caribbean cultures combined to become the multi-cultural Creole cuisine that we know today. It is an old and well-developed American regional-cooking style that proves flavor is truly a universal language. Rollicking stories and factoids link taste with tradition.